Teeth whitening is time consuming: most at home kits require several weeks. Crest 3D White 1 Hour Express Whitestrips give results in as little as one hour (view on Amazon). Whiter teeth aren’t just for cosmetic purposes. Having whiter teeth can boost your confidence as well as making you appear younger and healthier. Because of this, teeth whitening has become one of the most popular treatments in the dental industry. If you’re looking to whiten your teeth, know that you’re definitely not alone. However, teeth whitening can be sometimes be intimidating, and even dangerous. Finding the balance between quality results and high safety standards is often difficult, and using inappropriate treatments or incorrect techniques can be damaging to your teeth. Despite this, at home teeth whitening is still an attractive option for many. Thorough research can help to minimise risks and maximize results. We’ve done the research for you in this Crest 3D White 1 Hour Express Whitestrips review. It is widely known that professional in-office treatments aren’t the only teeth whitening option available. Common alternatives include bleaching strips, gels, pens and activated charcoal. Crest 3D 1 Hour Whitestrips are a form of bleaching strips that contain a bleach called carbamide peroxide. This is the active ingredient which works to whiten teeth. 1.) Do Crest 3D White 1 Hour Express Whitestrips work? Crest 3D White 1 Hour Express Whitestrips are designed to provide maximum results in minimum time. And they do just that. You can notice the difference after a single 1 hour treatment. Unlike other bleaching strips, which require use over longer periods of time, these whitestrips remove years of stains straight away. This is ideal if you’re looking for a quick fix, especially if you have last minute date or interview. You can treat your teeth in the morning, and then have pearly whites by the afternoon. If you’re looking for results that last 9 months and beyond, you will have to complete the full treatment plan, using once a day for 7 days (view details). 2.) 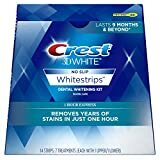 Are Crest 3D White 1 Hour Express Whitestrips safe? Despite delivering results so quickly, Crest 3D White 1 Hour Express Whitestrips are no more risky than any other whitening strip. They have a hydrogen peroxide concentration of 10% which is equal to Crest’s Professional Effects and Classic Vivid ranges. More importantly, 1 Hour Express Whitestrips use the same enamel-safe whitening agent that dentists use. It has been thoroughly tried and tested and, with proper use, should not cause lasting negative side effects. Some irritation and discomfort is not uncommon, but this is usually temporary and will subside after the end of the treatment. Even with enamel-safe technology, the 1 Hour Express Whitestrips may not be the best choice for everyone. 10% hydrogen peroxide is still relatively high and can cause excessive discomfort for those who already have sensitive teeth. For those concerned with sensitivity, other options like the Crest 3D White Gentle Routine Whitestrips are available. You can expect noticeable results in a single one hour session. Following the full 7 day treatment plan ensures that results last for 9 months and beyond. However, this is dependent on them being used correctly. Peel. These strips have a protective backing that needs to be peeled off before it can be used. Apply. Apply the strips to your teeth, pressing them on lightly to ensure a snug fit. Leave for one hour. Don’t forget that you need one strip each for your upper and lower sets of teeth. Relax. Thanks to Crest 3D’s non-slip Advanced Seal technology, you don’t have to sit and do nothing whilst you’re whitening your teeth. Instead, you can go about your day – have a chat or even a drink of water without the worry of them slipping off! Reveal. After an hour, peel away the strips. You’ll be able to see a difference straight away! After a full treatment of Crest 3D White 1 Hour Express Whitestrips, you can expect to see results for at least 9 months. In order to get the best results, you should use them for an hour a day over the course of 7 consecutive days. You can also maximise their efficiency by rinsing your mouth out with water after consuming foods and drinks that are known to stain, such as red wine or coffee. Crest 3D White 1 Hour Express Whitestrips are great if you need results in a hurry. However, they aren’t suited to everyone. If you have sensitive teeth, opt for Crest 3D White Gentle Routine Whitestrips which use a more gentle formula. For the most long-lasting results, try the Crest 3D White Whitestrips With Light Kit, which gives results that last 36+ months. If you like the idea of fast teeth whitening, but would like long lasting results too, Crest offers bonus packs for many of its whitestrips. These bonus packs, like the Vivid Plus box and the Professional Effects Bonus pack, include two 1 Hour Express Whitening Treatments alongside their treatment plan. Inactive ingredients: PVP, PEG-8, Water, Acrylates Copolymer, Sodium Hydroxide, Sodium Saccharin. Crest 3D White 1 Hour Express Whitestrips are perfect if you’re looking for a quick fix before an event – you’ll notice the difference in as little as one hour. They produce long-lasting results after just a week’s worth of treatments proving to be a budget-friendly alternative to professional whitening. If you’re looking for a home alternative that quickly and accurately replicates professional whitening, Crest 3D White 1 Hour Express Whitestrips are a great choice. 1. Can results really be seen in an hour? Yes – the 1 Hour Express Whitestrips give visible results after just one 1 hour treatment. However, for full and long lasting results, the whitestrips should be used daily for a week. 2. Can I use just one strip to cover both top and bottom teeth? A separate strip should be used for each set of teeth. 3. Can the 1 Hour Express Whitestrips be used with braces? Crest 3D Whitestrips should not be used with braces. While it is unlikely that the whitestrips will damage the braces, it will result in a color mismatch once the braces are removed. 4. Is this product ADA Approved? This product is not currently ADA Approved. At the moment, only one whitening product has received the ADA Seal of Acceptance: the Crest 3D White Glamorous White Whitestrips. 5. Do these work on crooked teeth? While best results can be seen on straight teeth, with care, good results can also be achieved with crooked teeth. Be sure to press the whitestrips around all the edges of the teeth. You can use a toothpick to help with this. 6. I have white spots on my teeth after using this product – is this normal? Bleaching your teeth can dehydrate them and, in this case, white spots may appear. These are usually temporary and will fade soon after treatment is finished. 7. Do Crest Whitestrips expire? Yes, Crest Whitestrips expire and the expiration date can be found on each box. While the safety of the whitestrips is not compromised, the whitening agent may be less effective after the expiration date. Colgate Whitening Pen: Will It Actually Make Your Teeth Whiter?